Although square foot gardening reduces 99% of weeding, it doesn’t control all those pesky pests and diseases. While I am personally not averse to occasional use of chemical pesticides and fertilizers, I always try an organic method first. In his book, Mel talks about the necessity of using multiple kinds of compost or better yet, making your own! If you spend the money on good compost, you reduce the need to add extra fertilizer at all. By mixing and matching different compost you create a nutrient rich environment for your plants. Since you add compost every time you plant, you don’t even have to worry much about rotating where certain plants are grown. If you have been cheap about it, and only used one type of compost, you may need to supplement with fertilizer. My cousin introduced me to this book by Jerry Baker. Combine and put 1 cup under each transplanted tomato or melon before planting. Combine and apply with a spray bottle. This suffocates the spider mites. Combine and sprinkle on cabbage. After they eat it, the flour expands and kills the worms. To fight aphids, I plant a little basil nearby. I have 10 times less aphids on my lettuce when I do this. There is nothing more frustrating than watching your plants suffer and die from disease. Even though I live in an arid climate with almost no humidity, my zucchini and squash always suffer from powdery mildew. I think it’s because the leaves get watered by the irrigation from the lawn and nearby park. This concoction works, but you have to be regular and diligent about applying it. Combine and apply with a spray bottle. Catch it early or you might need to resort to stronger chemical methods. These are just a few of the many many “recipes” found in the book. 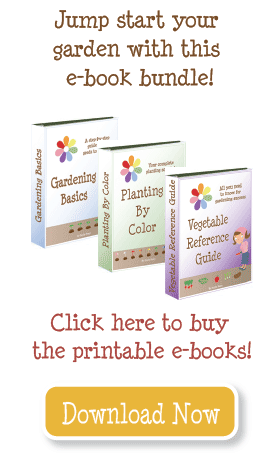 If you are interested in chemical-free gardening, I highly recommend purchasing it! Two bricks. 🙂 Or pesticide. Do you have any suggestions about small green grasshoppers and what can i use to eliminate them? If you check the article on Spinach, there is a link to a reference sheet on the bottom. It lists 3 pests that could be bothering your peppers. Start there, then Google. 🙂 I often find an image search has helped me identify bugs and problems. Any suggestions as to what is chewing on my spinach. My lettuces don’t seem to be affected. The spinach is just a few leaves on each plant. Sometimes a third of a leaf is eaten, sometimes a few tiny holes here and there. I wonder if this is something I need to control before it gets out of hand or just live with. It so far isn’t killing the whole plant. Also I wonder if I am seeing the damage of 2 different pests or if there is one culprit. What I read about blight is that it will come back year to year, so the best solution is to rotate your crops and avoid planting the veggie with blight in that spot for several years. Can you give any advice on what to do preventative for early blight next year. I have cleared old stuff out fairly well from last years problem and it came back BAD this year again on my tomatoes and peppers. Is there a soil treatment or winter planting i can do to help amend the area for next season. I wanted to plant lettuce, carrots, spinach, or broccoli for the fall crop and worried they won’t do well b/c of the blight problem. If it’s the same problem as mine, it’s pill bugs, or what my kids call potato bugs (not to be confused with REAL potato bugs). You can google an organic solution, or I just sprinkle a little Sevin around the edges of the square. Once they get big enough it’s not a problem, but if the entire first leaves get eaten, you’re sunk. Just replant. Help,something is chewing my new green bean leaves half off. I see little flies and a few ants in my raised 3’x8′ container garden, but I can’t catch any bug doing it. Love to hear any ideas, it’s so sad to see your little beautiful plants being eaten. Thanks. To Amy Sue: sounds like cutworm to me. I cut empty tiolet paper rolls in half and placed them around my plants, about 1/2 inch into the soil and that helped alot. Any suggestions for warding off whatever critter is nipping my veggies off? I planted a bunch of veggies on Sunday and Monday two cucumbers and one tomato were nipped off through the stem. I don’t know if it’s rabbits or chipmunks but I’m not happy! Jon–right now, I don’t have any answers but as the season goes on I hope to tackle pest problems. I understand certain flowers provide helpful vegetable pest control. Would you be willing to add some of those flowers to your spring planting schedule? I’m asking because I don’t know when to plant the flowers I want to put in my square foot garden. This year I want to put a square each of geranium, petunia, pansy, and marigold in my garden. Emily, I went outside today and my Husky Cherry Tomatoes top leaves were all dried out, curled and black. Then I took a closer look and saw little light color bugs all over them. This is my first year gardening and i googled a picture of an aphid, it didn’t look like an aphid unless they are still young or something. The thing I thought was weird was, it was only my cherry tomatoes that were affected, my romas that are in a square right next to them were not affected. please help me!!!!!!!! I had a batch of compost that brought tons of little flying critters too! I’m not sure if my plants were big enough that it didn’t matter, but they didn’t seem to do any damage. You might wait to see if they even survive until the plants get bigger–sometimes the life cycle is so quick you don’t have to do anything. Your best bet is to catch some and take them to a local ag co-op or extension office. Or do some research and see if you can figure out what they are–just describe them “flying knat” or “roly-poly bug” in a Google search and see what you find. Good luck! I recently started a raised bed vegetable garden, we filled it with a mixture commercial garden soil and compost. My seeds are now beginning to sprout, everything looks great. However, yesterday I noticed very tiny little bugs on the top of the soil. I further investigated and noticed they are covering every area of the top soil but they are not below the surface. In the same area I also have a few container vegetables, I used potting soil in those and there are no bugs in them. I sprayed some vegetable insecticidal soup over the top layer but that was ineffective, plus they are all over the soil and its tough to make sure every inch is adequately covered. Any ideas on what they might be and if they are harmful to the plants? Often, the problem isn’t the ants, but the aphids that come along with them. However, I looked up typical strawberry pests, and neither were on the list. This is our first year planting anything!! Both of my daughters planted 2×3 gardens and in one square foot they placed a strawberry plant. Now we are seeing lots of ants through their gardens……We put out some grits as we had been told that would do the same thing as Amdro. We know it works great on ant hills but will it work to keep them out of the garden? Is there anything else we should try? Or are they a big deal at all? Thank you so much for those spray recipes. I will be sure to try that powdery mildew one later in the year. All the curcurbits seem to succumb much too early in the season. If you are blue, it is quite early to plant tomatoes. You are still on week -1, which means those tomato plants are at risk if the weather turns cold. The main thing you want to protect them from is frost. You might check into buying some walls of water. They are plastic cylinders that you put water in and put around the tomatoes. It uses the sun to heat up the soil and air around the plant, and will prevent freezing. Wow, love your blog, have subscribed to the colour emails, I’m blue group, and as I have never ever grown vegetables in my life I need all the help I can get. I purchased some tomato plants last weekend and have hardened them off. They are sitting under the deck right now and I was wondering If I have done this to soon. Should I have waited til a few days before I’m ready to plant. It is way to cold this year as the temp is only about 10 degrees C. which is about 50 F. Thanks in advance for the info. Thanks so much for this post. I have what I believe are spider mites all over my rosemary bushes. As soon as I read your blog post I mixed up some of the spider mite killer and sprayed it on the rosemary. I’m going to do it again tomorrow morning too. I hope it works! I haven’t hunted down earthworm castings–I would try asking at a nursery and/or farm and garden store (I love my local Intermountain Farmer’s Association). I have a friend who made her own. I’ll have to ask her. I doubt the brand of instant tea matters. And putting wheat on your cabbage probably won’t work. You can try buying (or borrowing) the book to see if it has another solution. I have noticed it offered multiple recipes to address the some of the same problems. Powdery mildew looks just like it sounds–a powdery white coating on the leaves of squash. And I think my potatoes had a fungal disease–I ended up waiting so long to treat them that I had to resort to a chemical anti-fungal. Honestly, I haven’t faced squash bugs so I don’t have an answer. But I’m 90% sure this book would! Perhaps you could even check it out from your local library! Good luck! Any answers on how to deal with the dreaded squash bug. I am out there twice a day picking them off but this is getting crazy. Help. Oops, I just transplanted my tomatoes next to the house this morning – but I have a few more that will go out back in the garden once soil is warm enough. Can you tell me where I get earthworm castings and what kind of instant tea works best? Any other suggestions for the cabbage worm killer? I’m allergic to wheat and so it probably wouldn’t be a good idea to put it on my cabbage. What does the powdery mildew look like? And do you apply it to the leaves or just the veggie? This is my first year growing zucchini and squash. Also you said something last year about your potatoes having a blight or something. How do you spot that and what is the treatment?